Burning Man - wow... how to describe? I wrote in an email to friends where I described BM as "An endless Interdimensional Mardi Gras and Carnaval for Mystics and Wizards inside a very large Salvador Dali Painting." A continuous flow of Synchronicity.... that was the core of my experience and the experience of friends at Burning Man this year. Before I ventured to the desert, I wrote my latest entry as an offering to others who would join me. Your poem makes my mind tingle with inquisitive excitement. the divine purpose, presence and placement that we surround and embody ourselves with and everything around us, helps us evolve towards a higher consciousness that allows the space to bask and grow." Yes, follow the story not the events! As I arrived home, I walked in my front door and noticed the amazing oracle deck made by my friend Delvin Solkinson created. 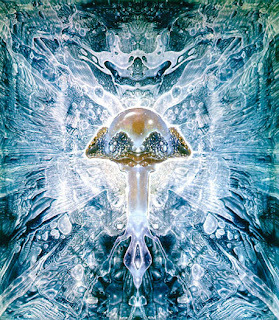 The card "Clear Spirit" was on top with Robert Venosa's painting "Shroom Glow" as the artwork...hmmm. Delvin's words describe my experience of Burning Man precisely. For me it was the continuation of the synchronicitypaloozathon...delivering us to source.